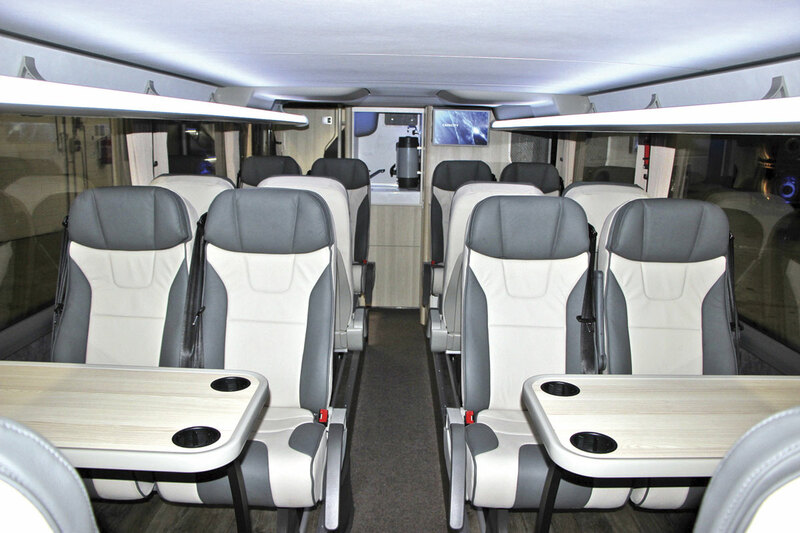 With the VDL Futura FHD2 selling well in the UK and Europe and the mid height Futura FMD2 taking off to the point that it now accounts for 20% of Futura sales, VDL has turned its attention to the double deck market with the unveiling of the Futura FDD2 coach. 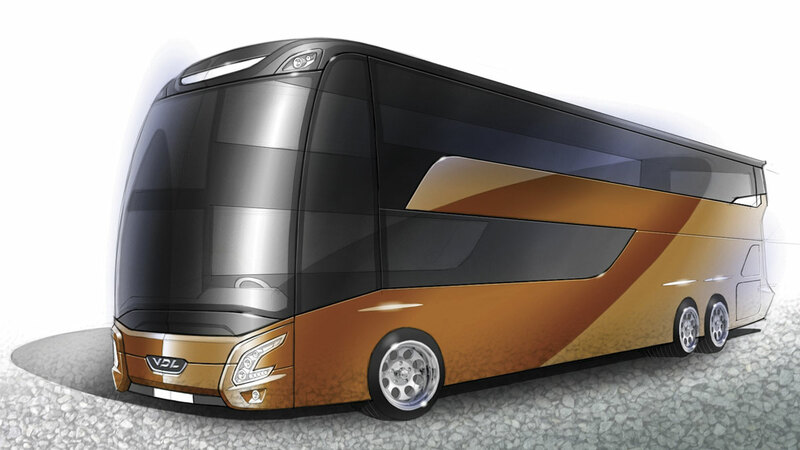 It had been promised at the time of the VDL brand launch, when the Bova, Berkhof and Jonckheere brands were abandoned, that there would eventually be just one coach range, all called Futura, and this latest step will take VDL a step nearer to the goal. 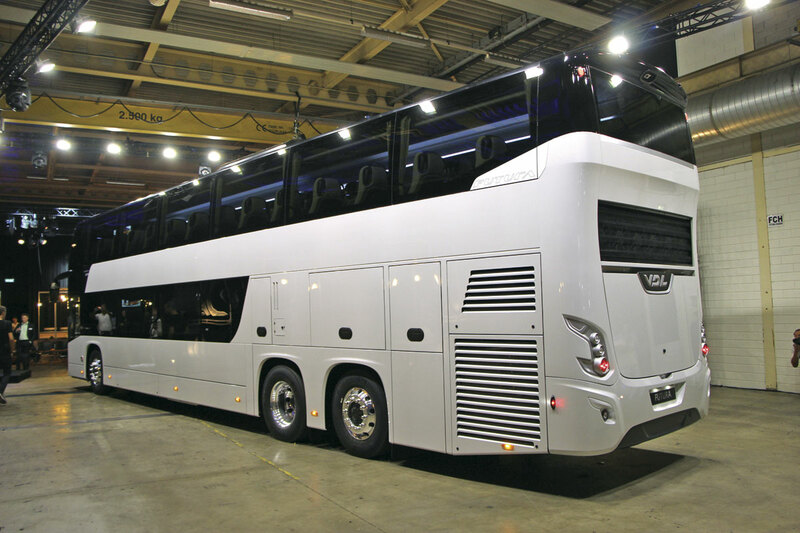 VDL has a fine pedigree of building double deck coaches as both Jonckheere and Berkhof offered them. Previous generations included the Jonckheere Jubilee P99 and Monaco and the Berkhof Eclipse, Excellence 2000HD, Excellence 3000HD, Axial and latterly the Synergy. 1992 even saw the creation of the double deck articulated Excellence 2000HDA. In the UK, VDL coach products are exclusively available through the associated Moseley group of dealerships: Moseley (PCV), Moseley in the South and Moseley Distributors. It was explained that in the product creation process, qualitative rather than quantative research had been undertaken with customers. Among the givens were that it should be top Western European quality, imbued with VDL DNA and with its brand values clearly defined as well as actually manufactured in Europe, the last being a VDL goal. It is to be built at the Valkenswaard facility in the Netherlands. 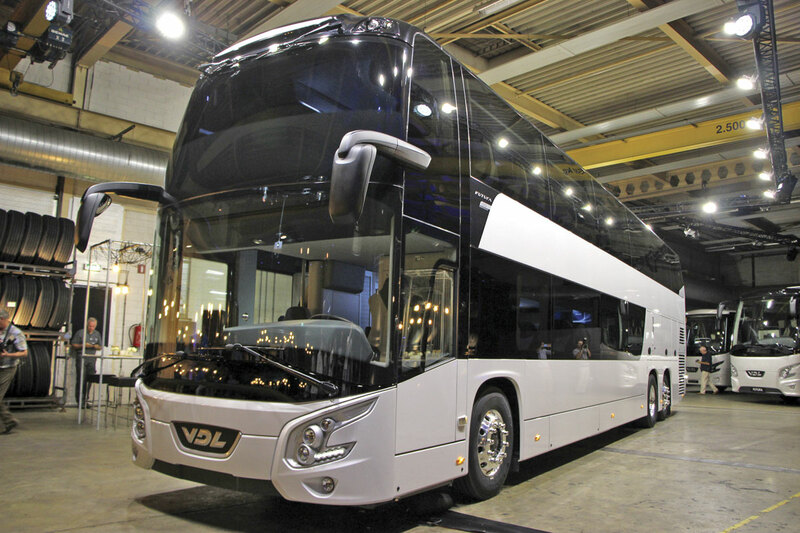 In developing the new coach, VDL collaborated closely with two design companies. Van de Veer Designers BV worked on the design philosophy and the exterior while Hegge ID worked on the interior. Representing these organisations Rik de Reuver and Frans Hegge explained what they had tried to achieve. Van de Veer Designers first worked with VDL on buses in 2008 and have recently been involved in the Citea DLF double deck project. Rik said that design was a powerful tool to communicate brand values. He pointed out that the average passenger was probably now driving a five year old Golf and probably had a different subconscious quality expectation to that of ten years ago. He said FDD2 had a North European style, closer to Volvo and VW than Iveco and Fiat, and was restrained rather than dramatic. In a further development of the VDL design language, it was characterised by flowing lines, offset surfaces and excellent surface quality. Among the tasks for Frans Hegge was integrating a version of the Futura dash design and a new area for the courier with a useful retractable work station. In keeping with its incorporation within the Futura 2 range, the FDD2 has been extensively restyled compared with the Synergy featuring the lower front panel look we have become used to on the Futura FHD2, including the mock lower diffuser, though integrated lighting in the top front corners is a new innovation. Apparently, powerful high mounted lights are popular in Scandinavia, but not legal in some other countries, in which instance the lights are installed but not connected. 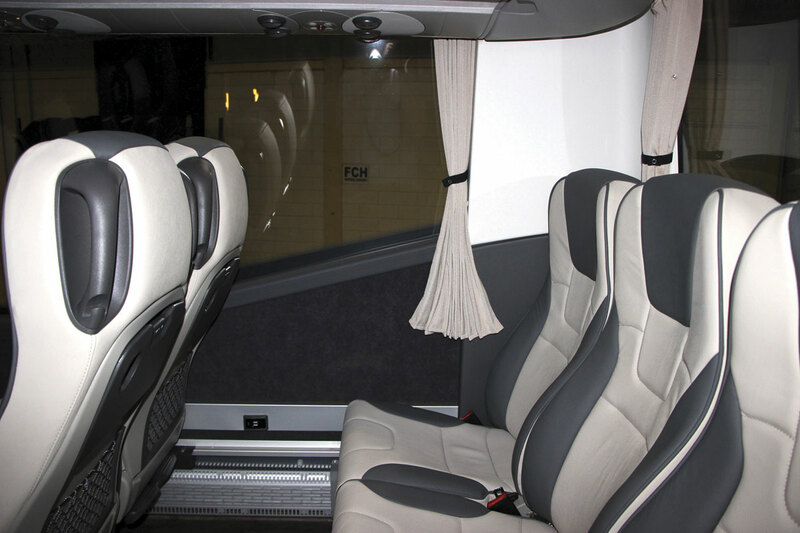 Similarly, existing Futura themes have been applied at the rear of the coach. A change in the method of construction has resulted in a big increase in lower deck headroom. Integrally constructed using modular principles, the structure features a sandwich construction roof and now the same technique for the upper deck floor. This has enabled the lower deck headroom in the aisle to be increased from 1,800mm to 1,855mm while headroom beneath the racks goes up from 1,370mm to 1,385mm. On the upper deck, there is a marginal reduction in the aisle height from 1,730mm to 1,724mm but headroom beneath the racks increases from 1,369mm to 1,377mm. A key element of the approach to the interior is that all corners have been rounded wherever possible. 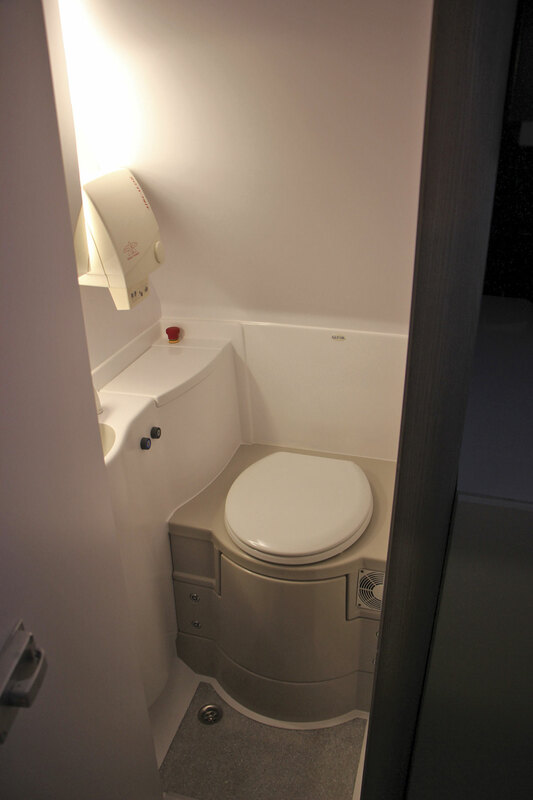 The toilet compartment has been designed to be easy to clean. Located on the offside rear of the lower deck, it has an 80-litre waste tank. Either water or chemical or combined chemical and water systems can be supplied. 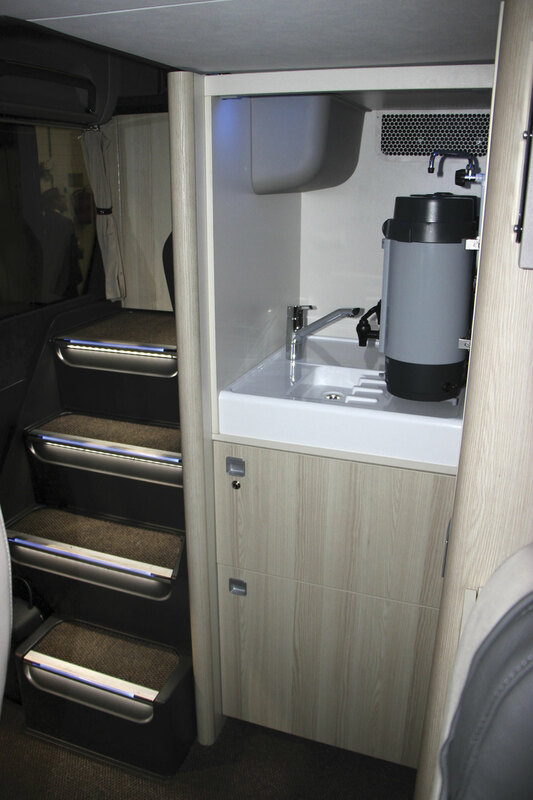 Together with a lightweight toilet compartment and weight optimised interior components and fittings, the overall weight of the FDD2 has been reduced by 280kg compared with the Synergy. Two lengths are being offered, either 13,085mm (FDD2-130) with a 6,195mm/1,500mm wheelbase or 14,145mm (FDD2-141) with a 7,255mm/1,500mm wheelbase. Other dimensions including the 4,000mm height, 2,280mm front overhang and the 3,110mm rear overhang are common to both models. The possibility of other length options such as a 15m, has not been ruled out in the longer term but it is believed that the two initial variants will meet the majority of the market demand. Turning circles claimed are 21,450m or 24,300m and the front wheel deflection angle is 52 degrees, while the rear axle steers. The air suspension is electronically controlled. Though there are detail differences, the basic front and rear axle modules are the same as on the FHD2. As was the case on the Synergy, the maximum seating capacity is 96 passengers if no toilet is specified. This is split 67/29 between the upper and lower deck. With toilet, the maximum is 91 (plus courier, plus driver) if you have full podests on both sides of the lower deck, decreasing to 87 with one wheelchair and 83 with two wheelchair spaces, as will shortly become mandatory on express services in Germany. In the shorter model, the maximum seating capacity is 84. Various seat options are available. 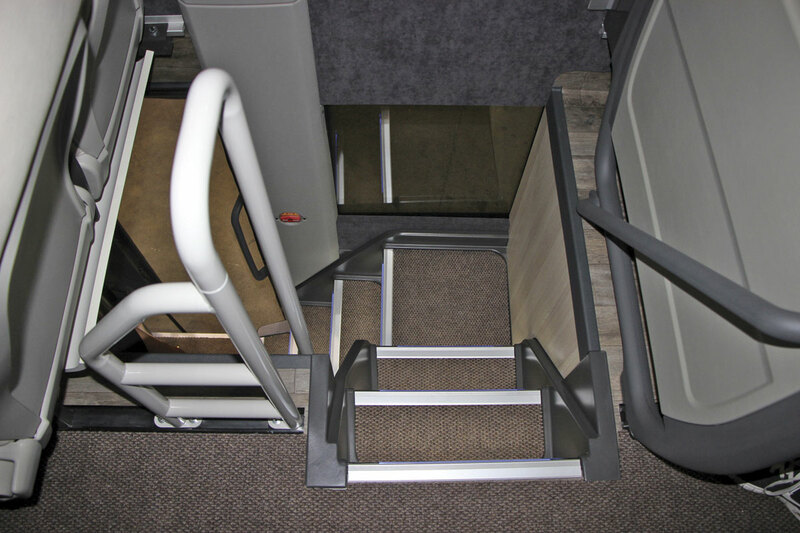 The VDL Class 100 unit is standard but you can upgrade to the 300 or 500 level. In creating more space elsewhere, some double deck coach cabs have very cramped cabs, but this was not the feeling the FDD2 gave, with plenty of room to move the seat back and obtain a comfortable position. 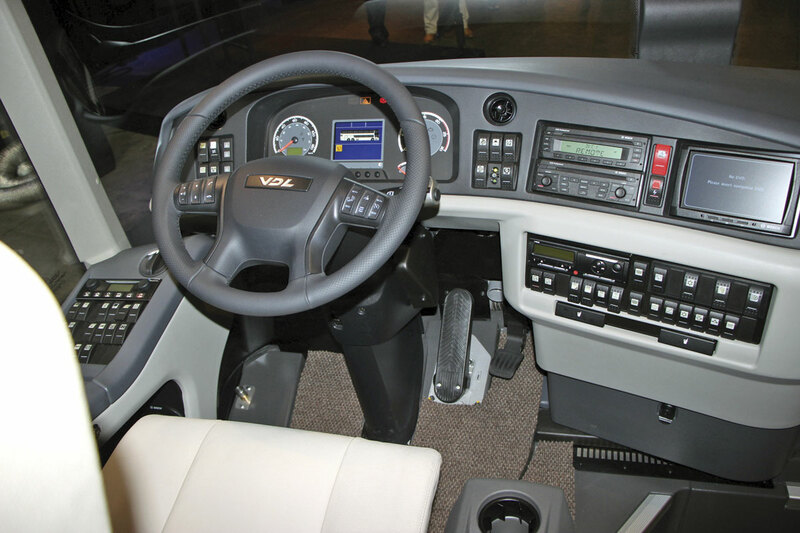 The dash itself has been divided into ‘priority areas’ with the most important functions controlled on a panel to the left of the driver (on left hand drive coaches), the next most important on the upper section of the dash to the right and those to which the courier also needs access in the lower centre. Controls for the radio, telephone and cruise control are part of the package offered with the multi-function steering wheel. Good storage space, both 12 and 24 volt sockets and a USB connection are also provided. A new climate control system has an increased total capacity of 10,500 cubic metres an hour and a cooling capacity of 44.6kW. I did not hear it in operation but VDL say that the motors controlling the valves and flaps operate silently and smoothly. There is a new easy to operate control unit, a recirculation facility on the front lower deck box and a low noise front box on the upper deck. 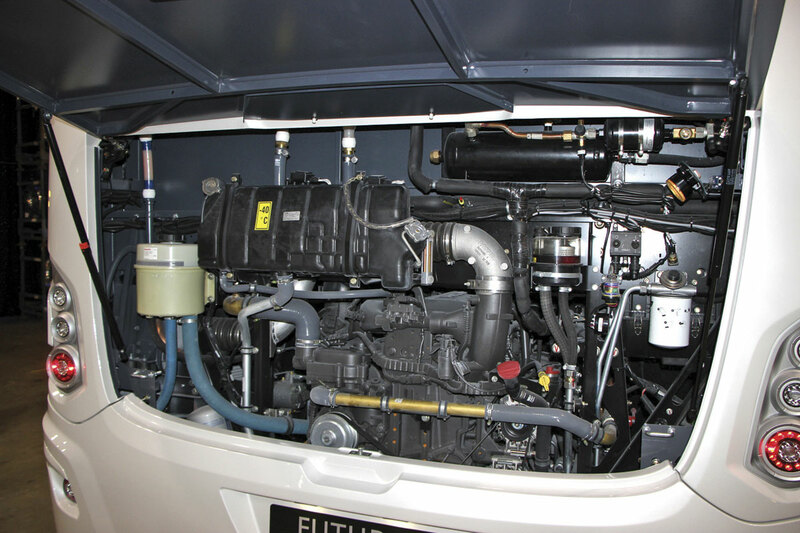 VDL is not a big enough company to develop its own engines so it buys them off other manufacturers which for its coach range is exclusively Paccar/DAF sourced. The same principle means the company can choose which other suppliers’ products it will use and in this regard it uses top brands like ZF and Pilkington Glass. The FDD2 features the in-line 12.9-litre DAF MX13 Euro6, six-cylinder engine which delivers 510hp/375Kw and 2,500Nm of torque at between 1,000-1,425rpm. Engine maintenance intervals are 90,000km. Exhaust emission control is by means of EGR, SCR and a diesel particulate filter (DPF). The transmission is the ZF AS-Tronic 12 AS2701BO automated manual. It has a 2.93:1 rear axle ratio and at 100kmh is recording 1,230rpm. The standard 445-litre fuel tank can be augmented by the addition of a 250-litre and/or a 205-litre tank to give a total fuel capacity of 900-litres. All of the systems that are going to be mandatory on new coaches from 1 November this year are there, including the LDWS (lane departure warning system) that makes the driver’s seat vibrate if he moves out of lane without signalling his intention to do so. Similarly, the advanced emergency braking system which applies the brakes if the radar beam (mounted behind the L of the front VDL badge) detects the likelihood of an imminent collision. 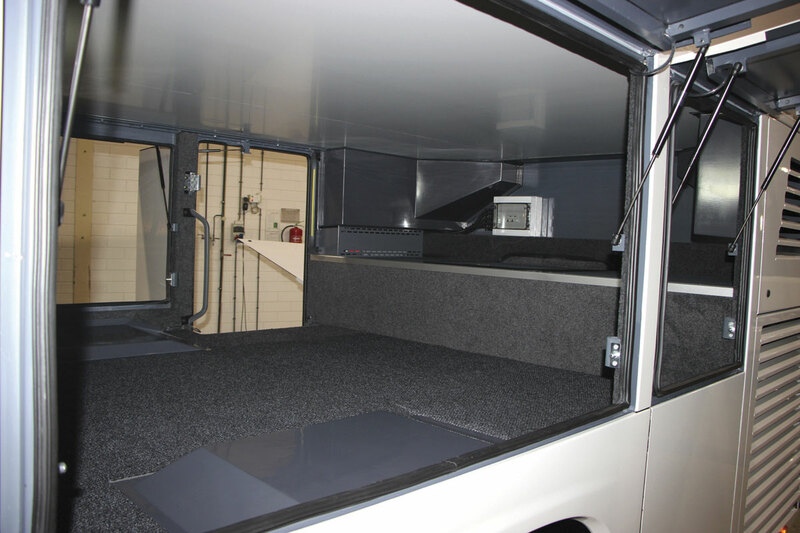 Minor jobs have been made easier, for instance the front corner bumper mouldings slide outwards to give access to the headlights and the windscreen washer reservoir. VDL have definitely moved on with the FDD2. The four key areas that particularly impressed me were the lower deck interior, the luggage arrangements, the stairwells and the front mirror arrangement. I could get all technical about the lower deck but put simply I like how it looks and I can stand up straight in it without bashing my head. The light coloured woods coupled with the rounded corners of the units, the trim materials used and the colours all contribute to a lower saloon that feels like a comfortable travelling environment rather than a dungeon. With the stairwells, what I liked was firstly that they are in the most practical places, with the forward one immediately to the left of the entrance rather than behind the driver where a bottleneck is inevitably created. 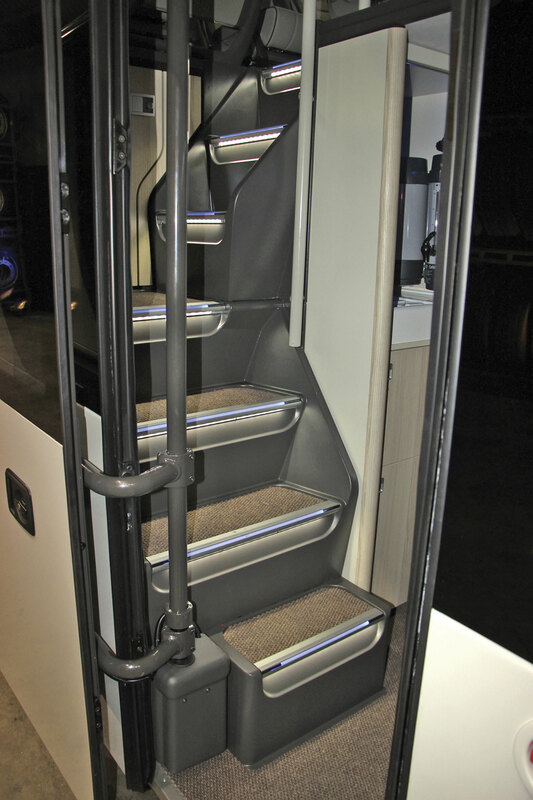 Secondly, the steps themselves are smart moulded units with integrated edge lighting and well provided with handrails. 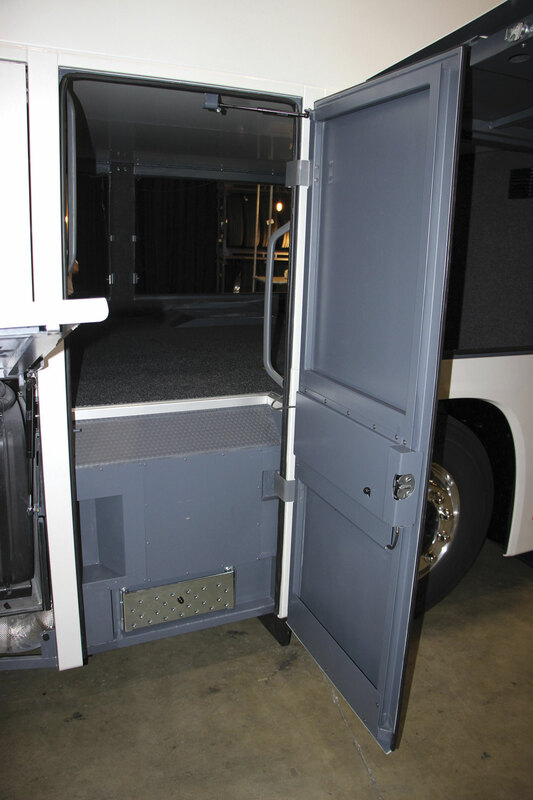 It is possible to specify a wheelchair ramp at the centre door in conjunction with the wider door option. 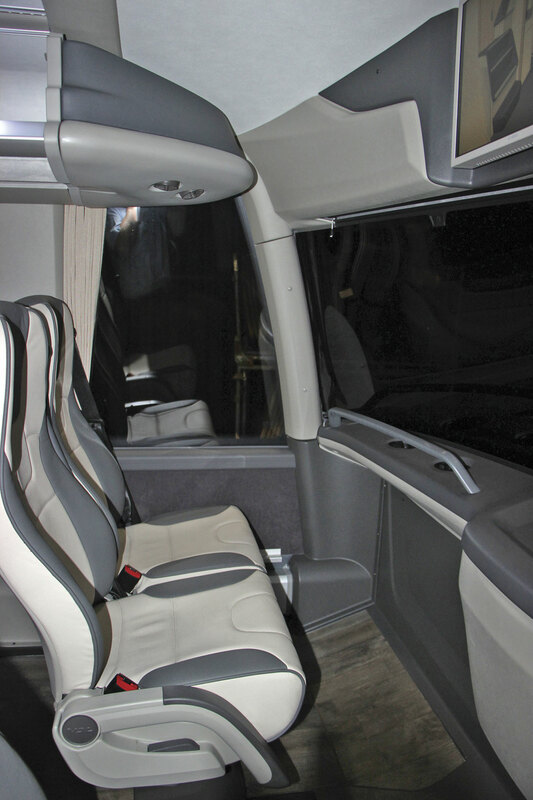 Some of the current double deck coach options have mirror arrangements that leave blind spots, have parts of the mirror obscured, or require additional mirrors to provide the necessary coverage. On the FDD2, these problems have been almost completely overcome. Firstly, they are mounted about two metre above the ground reducing the risk of catching pedestrians on pavements. In addition, the front upper deck floor is very slightly inclined, though not in a way that compromises legroom in that area, which enables the area of windscreen through which the driver is able to see to be considerably increased. It represents a big safety benefit. The main monitors are 19-inch Bosch units. As it is difficult for upper deck passengers to view a screen mounted on the front ceiling, VDL is offering the option of two small LCD screens mounted on the top of the front panel. Also available is a panoramic camera that shows passengers the road ahead. Impressive though the Futura FDD is, it will be quite a while before VDL is in a position to supply it in volume to potential customers, even in left hand drive, and a year beyond that before we can expect to see it in the UK. The vehicle we were shown was the prototype and had, I suspect, only been completed immediately prior to its unveiling. Indeed, I was told that it had still to return to the plant for attention to some aspects. I’ve no idea what these might have been because it looked very well finished to me. 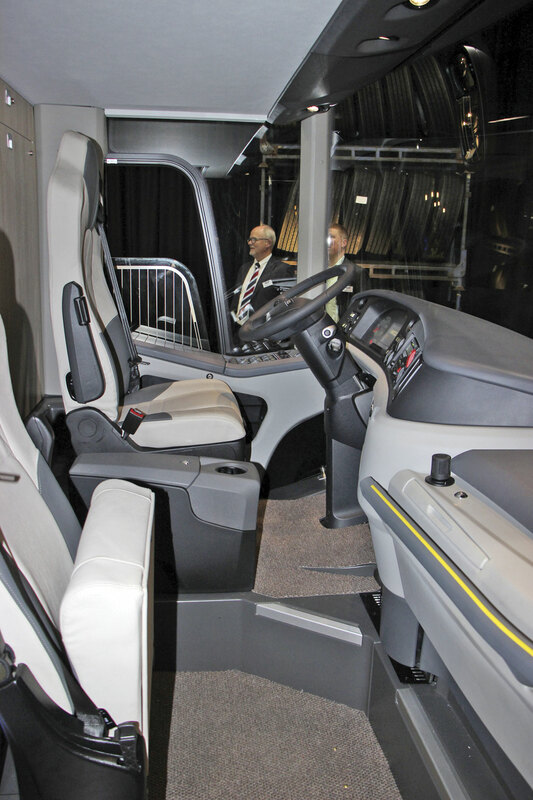 Once it has appeared at the Busworld exhibition in Kortrijk the task of productionising the model will start with the first left hand drive deliveries anticipated in 2016. Thereafter production will gradually be increased but MD, Remi Henkemans, told me that production would be constrained during 2016 with demand likely to outstrip supply. A total of between 20 and 30 units was probable in 2016. The right hand drive version will not come until 2017. I was told that some left hand drive examples have already been sold, though no details of customers were provided. Early demand is expected to be strongest in the Benelux, German, Italian, French and Scandinavian markets. With the limited availability, a small number will be offered to each country. In the meantime the associated Moseley companies will continue to offer the Synergy for double deck customers with a number of stock orders scheduled. There are also some European customers taking Synergy for line duties and it will continue to be built for them in left hand drive for a limited time after the FDD2 is in full production. 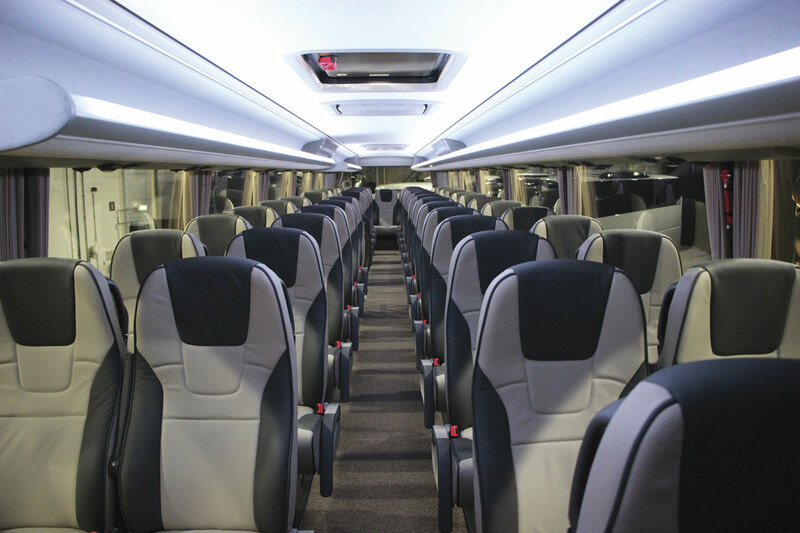 With the buoyancy of express coach markets helped by the increasing liberalisation Europe is seeing, the double deck coach is enjoying a renaissance. Total double deck coach sales in 2014 amounted to 343 units, up from 299 in 2013 and 236 in 2012 and more than the recent high of 311 in 2008. The market had fallen as low as 171 units in 2010. VDL believe a stable average is between 200 and 250 coaches. In his presentation, Remi made it clear that VDL’s expectations anticipate Futura FDD2 taking a greater share of the European double deck coach market than the ‘rather low’ 7%-9% currently being attained by the Synergy. A target of 20% ‘or more likely 30%’ was mentioned within a two to three year timescale. They intended to ‘go for it’. 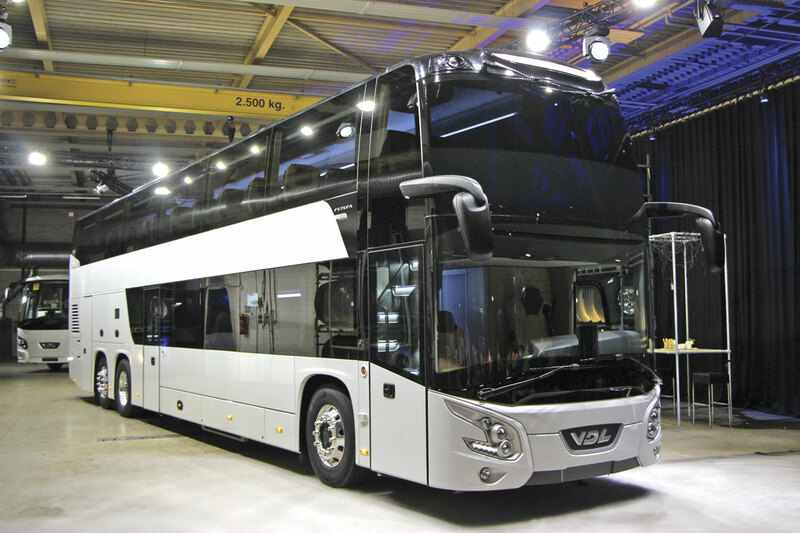 If it is to achieve this it is going to have to win sales off its competitors, the Setra TopClass S431DT, Neoplan Skyliner and Van Hool Astromega and to a lesser extent the Beulas Jewel and Ayats Bravo. It has to be remembered that a very important part of appraising a new coach is how it performs on the road and feels to travel on and as this was a static launch there was no opportunity to do either, but given the performance of other VDL products it is reasonable to assume that these are not areas that will have been neglected. If anything, based on experience of the set up of the AS-Tronic gearbox on the FMD2 during the recent Coach Euro Test, I would expect that VDL engineers will be putting great energy into ensuring that the components they buy from A-grade suppliers are set up to deliver to the optimum. The company counts driving and handling as one of its four core brand values along with attracting people, profit of ownership and pride of ownership. Don’t get too excited yet because it will be two years before the first FDD2s arrive in the UK, but I do believe that it is something to look forward to. 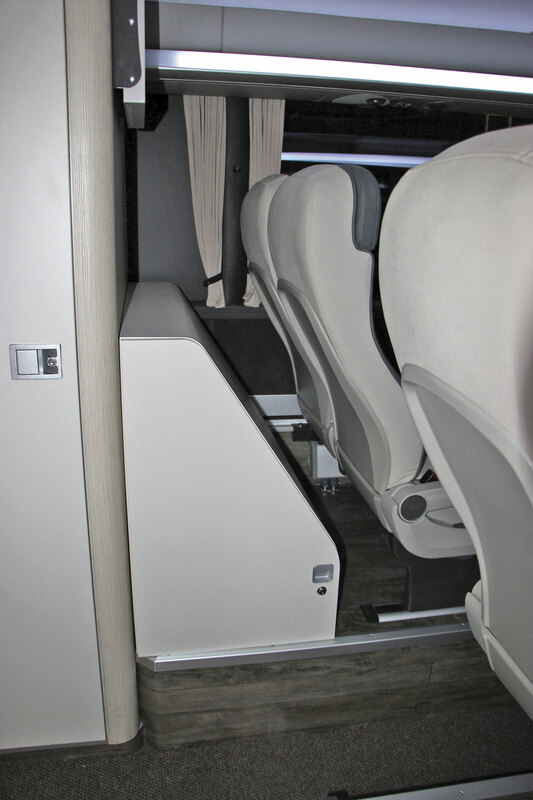 Gone are the days when British operators could choose from all of the leading European double deck coach options, but for those who do have a need for the capacity they offer, VDL has developed a product that incorporates some impressive advances in comfort, usability and safety.